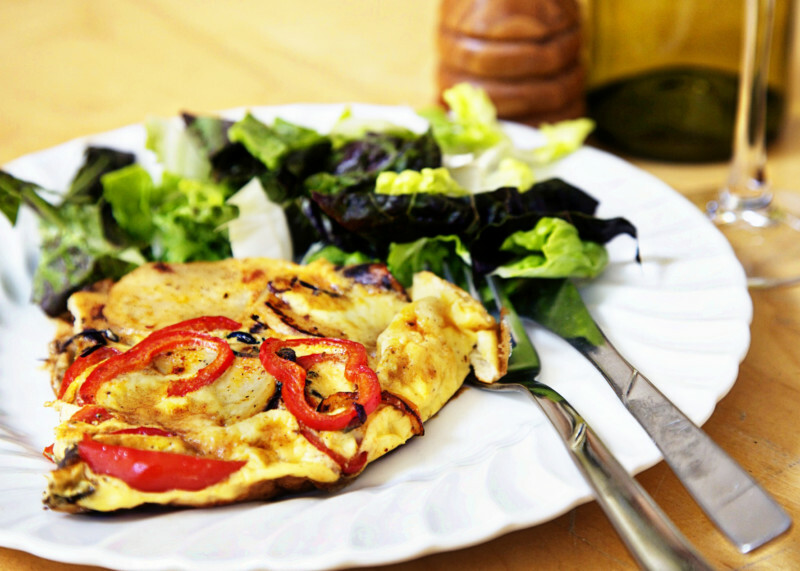 Omelettes are so quick and easy to rustle up and with this one, any leftovers are delicious cold for lunch the following day. Peel the potatoes and cut into bite-sized chunks. Rinse under running water and pat dry with kitchen towel. Warm the olive oil in a frying pan. Add the potatoes and fry over a medium heat for approximately 10 minutes or until they turn a golden colour. Meanwhile, peel and slice the onion. Wash, deseed and slice the peppers. Warm a tablespoon of olive oil in a 20cm wide frying pan. Add the onion and pepper slices, season with a large pinch of salt and gently fry for 10 minutes or until soft. In a bowl, lightly beat the eggs with a fork and season with the paprika, small pinch of salt and a grind of black pepper. Lift the potatoes out of the frying pan with a slotted spoon and place on kitchen paper to drain the excess oil. Add the potatoes to the onions and peppers. Pour the eggs over the vegetables, shake the pan lightly and cook gently for 3-4 minutes. Place the omelette pan under the grill for 3 minutes to finish cooking. Cut into large wedges and serve.